In the years since his death, Vincent van Gogh has grown to be seen as one of the greatest artists of all time. We've had biopics of our tormented Dutchman, he's even popped in as a character on such programs as Doctor Who. Loving Vincent is another type of biographical film: one completely illustrated in his style. Over 100 painters worked several years to make the world's first fully-painted feature film. This can be seen as either a gimmick or a step forward in animation. The question remains: Loving Vincent can be beautifully painted, but is it any good? A year after Vincent Van Gogh (Robert Gulaczyk) dies, Armand Roulin (Douglas Booth) is asked by his father, Postman Joseph (Chris O'Dowd) to deliver a final letter to Vincent's brother, Theo. Armand is contemptuous of Van Gogh and cannot understand why his father has such concern for him or his daft paintings. Nevertheless, he goes to find Theo. He is informed that Theo died shortly after his brother, a result of syphilis and despondency over his beloved brother's death. No one, however, knows where Theo's widow is, except perhaps one of Vincent's close friends, Dr. Gachet (Jerome Flynn). Armand then goes to Auvers-sur-Oise, where he meets with pretty hotel proprietress Adeline Ravoux (Eleanor Tomlinson), who is temporarily watching the hotel where Vincent stayed before his suicide. Armand then begins an investigation into Vincent's death. Why did someone who described himself in his last letter to Postman Roulin as calm and peaceful shoot himself six weeks later? As far as the Gachet housekeeper Louise Chevalier (Helen McCrory) is concerned, good riddance to bad rubbish when Van Gogh died. Could Vincent's death be connected to the questionable doctor's beautiful daughter, Marguerite (Saoirse Ronan), who leaves flowers on his grave every day? What about a young bully, Rene Secretan (Marcin Sosinski), who abused Vinnie but whom he stayed with because he picked up the bar tab? Could Vincent have actually have been murdered, as a rival doctor, Doctor Mazery (Bill Thomas) insists? Armand continues to try and unravel the mystery of Vincent, until he finally has an audience with Dr. Gachet. Gachet provides the final pieces to the puzzle: a frustrated artist, he and Vincent had an argument that hit too close to home for Vinnie. Gachet tells Vincent of Theo's diagnosis and how the pressures of supporting him have sapped his health. Gachet agrees to send the letter to the Widow Van Gogh. Some time later, Armand and his father receive a reply and a copy of Vincent's last letter. Johanna Van Gogh thanks them for their kindness, and we learn that Vincent ended his last letter to Theo with 'your Loving Vincent'. Loving Vincent reminded me of Citizen Kane, not in its technical brilliance but in terms of the story; the screenplay by Jacek Dehnel and co-directors Dorota Kobeila and Hugh Welchman oddly follow the same structure of Citizen Kane: a great man has died, leaving behind final words. A disinterested man goes to find the meaning of these words and interviews various people who knew him, with the mystery of who this Great Man really was growing deeper. Ultimately, the mystery of the man remains. There are differences between Citizen Kane and Loving Vincent in that in the latter, the mystery it is of what drove him, while in the latter is whether he was murdered or not. 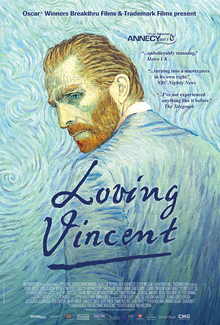 I think it is important to look at the story of Loving Vincent and examine it because that is where the film will rise higher or fall harder. 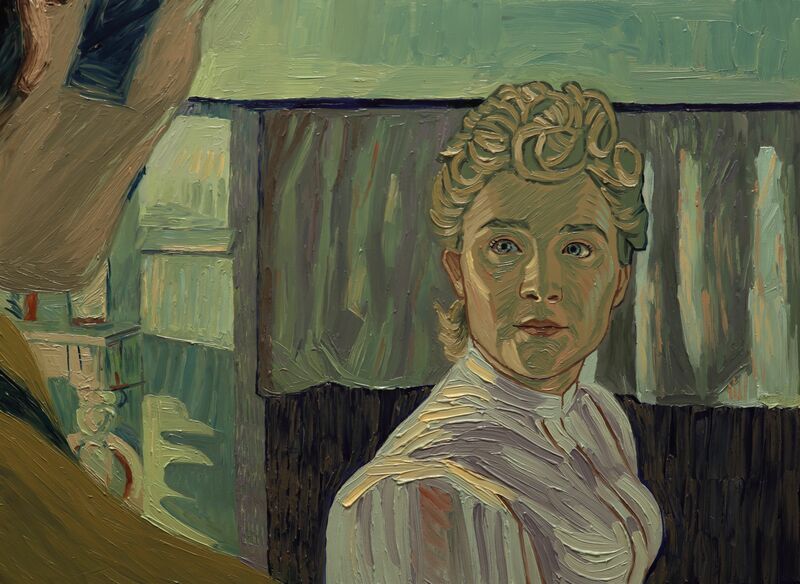 This is the question that viewers should ask while watching Loving Vincent: if it were not breathtakingly beautiful, if it were not made up of a series of paintings in the Van Gogh style, if it were a regular, live-action film, would it still be interesting? My answer is: not as much. The paintings are not only true to the Van Gogh style, but are truly impressive and beautiful. To be fair, I preferred the black-and-white paintings used to show the flashbacks versus the present-day color paintings. There seemed to be a greater 'illustration-style' to the flashbacks. Some of the sequences are breathtakingly beautiful. Of particular note is when we get echoes of a Van Gogh painting or the film transitions between black-and-white and color, keeping in mind the difficulty of having to paint something using less or more color. However, what of the story itself? We get a strange circumstance where most of Loving Vincent is Armand interviewing all sorts of people who tell him all sorts of things about Van Gogh, then he goes and talks to other people and brings up what he's heard before from the prior interviews and states them as fact. Armand, curiously, appears never to question anything told to him, and once he's told something that contradicts the first statement, accepts that as the truth. Armand as a character never seems to question anything, or be suspicious of anything. We get a lot thrown at us about potential murder and secret love affairs, only to have that taken out in due course. If Loving Vincent proves at least one thing, it is that Douglas Booth simply cannot act, even when painted. Like the film, Booth is beautiful, but he is as flat as the portraits with a very dull interpretation: generally expressionless. While it does not look like the actors were rotoscoped (which makes the creation of the film more impressive), the actors were shot in front of a green screen. Given that, it is surprising that they would cast Booth, for he has yet to show he can actually act. Loving Vincent gives no proof that he can. It is especially hard for him given that he has to be with actors who are of a higher caliber and who gave wonderful, impressive performances. There are few actresses who can match Saoirse Ronan, and her Marguerite is a Spinx, mysterious and beautiful and gentle and haughty. McCrory too was strong as the cantankerous Louise, if at times a bit broad in the way she showed her contempt for dear old Vinnie. Tomlinson was enchanting as the gentle but shrewd Adeline, who fancied Armand but was not easily taken in. I'm probably one of the few people who has never been particularly wowed by O'Dowd, but in his brief turn as the Postman he showed himself to be a good, gentle man. Flynn's Dr. Gachet was impressive as a man who carried guilt over his actions, especially since he recognized Van Gogh's genius. Loving Vincent is visually impressive and visually a great tribute to Vincent Van Gogh. The story is not the greatest, and the lead performance is dull (though like the paintings, quite lovely to look at). However, the art and some of the other performances more than make up for these flaws.